Cute little 8.4 ounce can holds this 11.5% alcohol by volume (ABV) barley wine. This one should be more of the “California” variety as it has an IBU of 92 (highly bitter). California-style adds a hop bitterness, while English barley wines have a syrupy rich dark fruit quality. 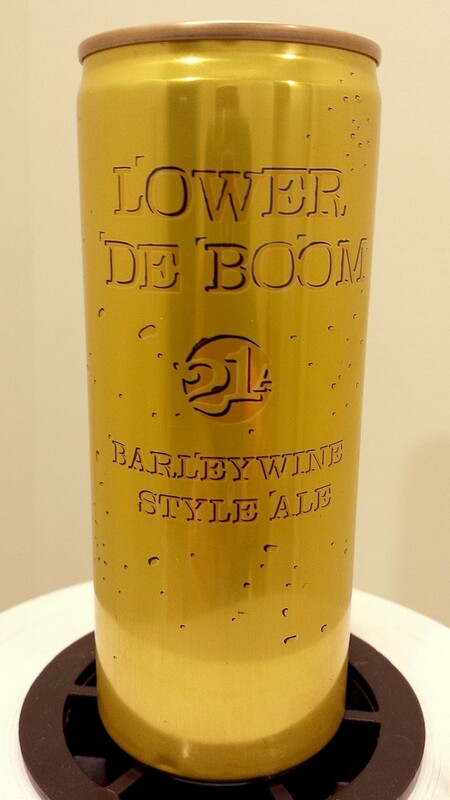 Lower De Boom is very simple — boozy, a bit fizzy somewhat meek with some green apple tartness and very little in the way of any caramel or dark fruit sweetness. Hops are off-bitter and harsh. I’ll label Lower De Boom as disjointed since the flavors don’t work in harmony or have any balance. I’m not really enjoying Lower De Boom and after the week I’ve had – I need a better experience. Lower De Boom gets 72 points in my book. Another entry in the burgeoning category known as sessionable beer. Sessionable, meaning you can toss back a few over the course of a session (party, picnic or night out) and remain somewhat coherent and upright. The alcohol by volume (ABV) of these sessionable beers are typically under 5% and Bitter American checks in that range – 4.4%. While there are plenty of mass produced beer that register under 5%, let’s be honest, they taste — well — terrible. Years ago, I used to carry hop pellets and crush or dunk them into whatever bland beer was being served. I’ve heard that there is a liquid concentrate that can be added to beer to alter the flavor. Thankfully, some of the better craft brewers are circling back to a category that (hopefully) offers beer enthusiasts a better tasting option. They seemed to have struck a chord as some of the popular sessionable beers like Founders All Day IPA are flying off shelves. Right off the bat, Bitter American reminds me a lot of the of Founder’s All Day IPA — or is it the other way around? Bitter American is all massive and somewhat pleasant bitter hops. Seems that this approach has become the standard formula for sessionable beer. They jack the flavor up with hops since hops don’t lend any alcohol. Hops just add flavor, bitterness and aroma. Overall, it belies its 42 IBU. Hops are the story here and they impress with bright lemon. Some lingering bitterness long after finish. Definitely, a one dimensional beer. Only because it served a purpose – I put All Day IPA between 86 and 87 and ultimately settled at 87. I’ll put this couple of ticks behind that at 85.